Yes Dianne “Paranoia strikes deep and into your heart it will creep.” What’s with the desperation of the chair warmer from CA putting her campaign on cruise control? Perhaps in your continued state of confusion and delusion you believe that voters in CA have anointed you, that your position representing California is purely ceremonial. That seems reasonable, unchallenged in your last four virtually uncontested elections you have become smug, and completely out of touch with the vast majority of the people you were supposed to represent. ( Indeed they are and it’s time you found a clue. They are rejecting the presidents rapid attempt to turn the United State into a socialist state.) They hate your vision for America. It has been a failure every where it has been tried. It’s impossible to tax and spend your way to prosperity. In 2010, we saw extreme partisans get elected to office at every level of government. And since then, we’ve seen the results. It’s O.K. if I call you Dianne isn’t it since you are frequently hammering me with your requests? Let me clear something up for you when you talk about partisan wrestling . You are actually referring to the first two years of your boss’s tenure when your party held both houses of congress and you accomplished very little if anything that middle America desires. Of course there was no bitter partisanship when then Speaker of the House would not allow the Republican to be brought to the floor of the house. So what’s with this illegitimate plea for money. 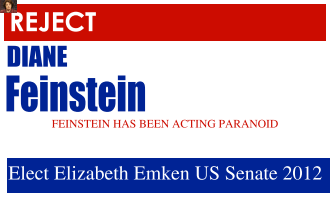 If your handler’s have woken from their slumber perhaps they too are aware that Elizabeth Emken is going to send you home where you belong. Clearly Diane, you have been “TOO WRONG” FOR ” TOO LONG” so you are about to be shown the door.